TRI-CITIES, WA. 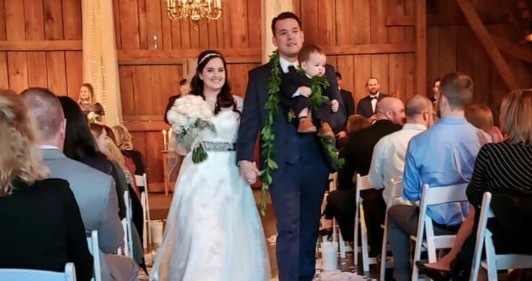 (THECOUNT) — Nickolas Augustavo, a firefighter from Washington state and his new bride Nikki, were on their honeymoon when they got the tragic news that their 18-month-old son had died. A GoFundMe account has now been established to help Nickolas and Nikki as they mourn the loss of their little boy, Kaysen. According to a social media post on the Hanford Fire Department Union Facebook page, the toddler died in his sleep on Tuesday, reports News4SanAntonio. Three days into the honeymoon, the couple heard the tragic news of Kaysen’s passing. Fire department staff members from around the state have reached out to help the family in this difficult time. A GoFundMe has been started to help the family. It is with deepest regrets to share the unfortunate news about the passing of Nickolas Augustavo’s Son. Please keep Nickolas and his family in your prayers. Steve Griffith will be the point of contact. “My Friend Nickolas Augustavo has been a Firefighter for several years in the northwest. Starting out like so many of us on the Tri Med Units of the west side. He then starting volunteering with North Highline and eventually went to work for Hanford Fire. He’s all “westside,” as his Eastern Washington brothers and sisters like to tease him about. He was a Baseball player and a fine one at that. He worked his way in to college ball and then became a youth pitching coach. We had something in common when we started at Hanford, that’s what drew us together. Neither one of us knew a thing about fighting Wildland fires, it showed and we knew it. Over the couple years of commuting with “Augie” as we like to call him, I learned much more about him. I learned about his love for his Mother and Father, his Brothers and Cousins and his desire to have a family. Nickolas Augustavo and Nikki Tallman met a couple years ago. Just over a year ago they had a beautiful baby boy named Kaysen James. I don’t know much about Nikki, but I can see how she looks at Nickolas and even more importantly how he looks at her. He runs out of shift to get home faster than ever. On Saturday March 9th at 1630, they married with Kaysen as the ring bear. He, at the age of 15 months probably wasn’t going to reliably deliver the ring so they choose to have him wheeled in on a Radio Flyer red wagon by one of his cousins. It was a beautiful celebration of a life to be. Then for the first time left baby Kaysen with family and headed off to Hawaii for a Honeymoon. Tragically, just three days into their marriage, Baby Kaysen died in his sleep on the morning of March 12, 2019 while Nickolas and Nikki were in Hawaii. I know this because I was on duty that morning when he called me to tell me what happened. I was the first one he called, I then notified everyone I needed to. He called asking if I could find out any information because the tragedy hit in a department where I have close friends and family members so I was able to make some calls and piece a timeline together. There’s only so much I was able to be told, and that can be shared publicly. We won’t really know what happened for some time. This baby boy who was sitting on my lap three night prior has passed. It amazes me what can happen so fast with our community when the word gets out. Locals from around the state, Chiefs of departments and individuals have all reached out to me to see what they can do. 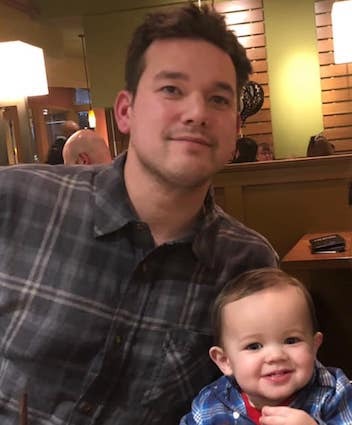 In a matter of hours they have offered counseling, food and one Departments Chief is Picking him up at the Airport, This chief selflessly has given himself to Nickolas and his wife, driving Nickolas and his Bride to where they need to go as so not to have them drive. I thanked this Chief as I cried for the 15th time today as he responded, “Its what we do for our brothers and sisters.” With Nickolas’s permission I would like to set up a Go fund Me account. This account will be used for Long Term counseling for Nickolas and Nikki as well as funeral expenses for Baby Kaysen, groceries and various bills to help through this transition. Sadly on behalf of Nickolas and Nikki Augustavo and the Local I24, Please contribute and Thank you for your support.